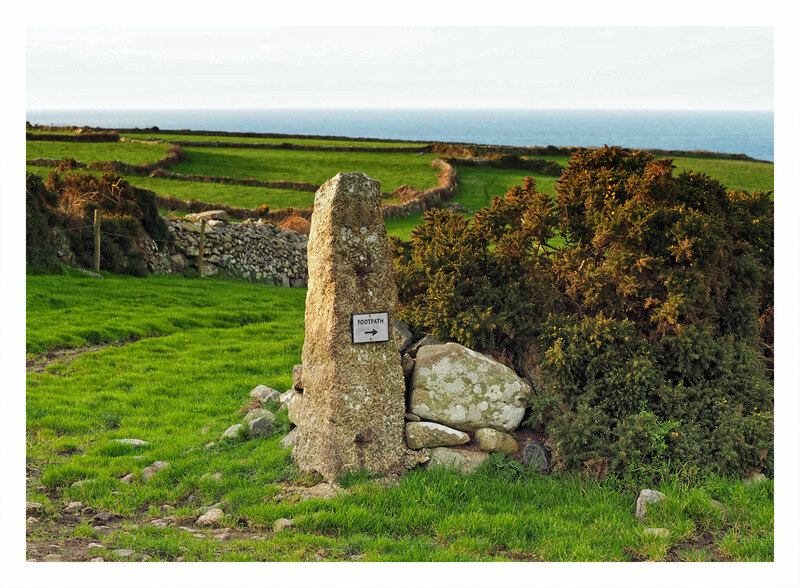 West Penwith. It has a very different character to the rest of Cornwall: it feels almost like an island. Remote villages and hamlets are strung along one of the most beautiful roads in the land between St Just and St Ives. Travelling by road is slow, tractors, trucks, German campervans, French motorhomes, sharp bends, drystone granite walls, abandoned tin mines, carns, views across the patchwork of ancient arable fields, cows heading for the milking parlour, bleak moorland, gravel lay-bys barely big enough to fit two cars, a maze of hidden lanes and paths and tiny trout streams trickling down to the aquamarine coloured coast. One day I will carry on to the actual Gurnard Head. A bit too chilly on this day. Haha… yes it can be quite an experience. I hate having to reverse because my car has a boot and I cannot tell exactly where I am in relation to walls! I’ll bet your next car will have a rear-view camera, which is becoming standard on new models. I am a little scared of all the technology in new cars and a rear view camera would probably terrify me! I think you’d quickly get used to it. The screen on the dashboard shows the rear view only when you’ve shifted into reverse. Our Subaru has another handy feature: if I’m backing up and begin to get too close to an object, the car beeps to warn me. I have been in cars that beep – that might be useful. Oh, the gorgeous power of lists! You’ve said so much with so few words. Coming from such a wordsmith as you I value this comment. Thanks Meg 🙂 You back in Spud yet? Leave for Spud on Wednesday. My daughter returns on Tuesday – probably a carrier for a northern hemisphere disease which laid them low in Szczyrk: probably weakened by their attempts to pronounce it! Ouch! There is a nasty flu like bug doing the rounds here which knocks people for six. I seriously suggest you avoid getting too close! I like the new name, seems we are all having change on our blogs. It’s gorgeous Jude, I hope there aren’t too many motor homes. The enclosed areas seem quite small, I wonder if that was about the livestock or the ownership. I stay away in the months of the motor homes and camper vans! I discovered that these could be ‘quillets.’ In Cornwall, a quillet is sometimes used to apply to systems of very small fields that have been created where land has been sub-divided as the result of inheritance. Ahh that makes sense doesn’t it? And anyway fields only need to be huge to accommodate ghastly machines. Small is good and quillet is a wonderful word. It is isn’t it! And I agree with you on the large machines. Mindst you these lanes aren’t exactly geared for large machines either! I dread meeting even a tractor!